Patrick J. Gallegos of Peralta, New Mexico, has been awarded the 2013 NBCC Foundation Military Scholarship. The NBCC Foundation, an affiliate of the National Board for Certified Counselors, Inc. (NBCC), recently awarded a 2013 NBCC Foundation Military Scholarship to Patrick J. Gallegos of Peralta, New Mexico. The military scholarship is awarded to service members and veterans pursuing a counseling education who commit to serving military personnel, veterans and families upon graduation. The mission of the NBCC Foundation is to leverage the power of counseling by strategically focusing resources for positive change. The military scholarship was created in 2009 to increase access to counselors for military personnel, veterans and families suffering from a shortage of available mental health professionals. Students from across the country applied for the five military scholarships, and the NBCC Foundation Board of Trustees awarded an additional scholarship due to the high caliber of this year’s applicants. As one of six 2013 military scholarship recipients, Mr. Gallegos will receive $5,000 to support his counseling education and facilitate his service to military populations. 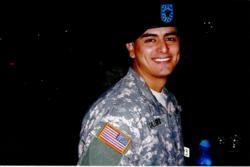 Mr. Gallegos will receive $5,000 to support his counseling education and facilitate his service to military populations. Mr. Gallegos is both a student and graduate of the University of New Mexico, where he is pursuing a master’s degree in clinical mental health counseling. Having served in the Army for over 10 years, Mr. Gallegos has experienced firsthand the great need for increased and enhanced mental health care as a mental health specialist. Upon graduation, he intends to work as a counselor with veterans suffering from post-traumatic stress disorder (PTSD). The NBCC Foundation has also awarded six $5,000 rural scholarships to increase the number of counselors serving rural areas.